An exclusive spot in the heart of Alquézar. 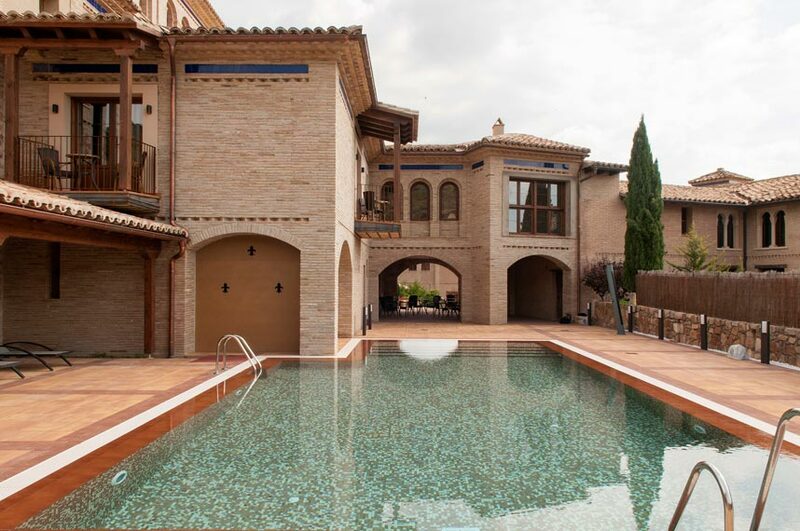 Since the summer of 2015, Hotel Villa de Alquézar has been offering its customers its exclusive swimming pool and spa facilities, offering real luxury in the heart of the village. In the summer season you can enjoy our swimming pool, designed to blend in with the architecture of the impressive Villa de Alquézar hotel, and relax in the peaceful areas around it. During the rest of the year, relax and enjoy the SPA facilities which include a jacuzzi, pressure showers, bubble chair. The SPA facilities was opened in February 2017 and is offered to customers as an option since October to May. Take a break and float around in our swimming pool! Take a break and refresh yourself in our swimming pool after a busy day visiting the village of Alquézar, taking part in the adventure activities offered in the area or hiking in the Sierra de Guara mountains. It will make you feel phenomenal! In the area around the swimming pool you can sunbathe, relax or transport yourself to another world by reading on our sun-loungers, all whilst contemplating the countryside around our hotel. 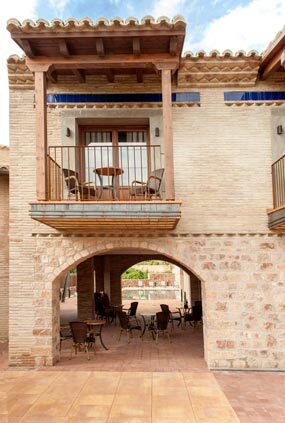 Hotel Villa de Alquézar is the place to rest, breathe in the fresh air and experience sensations. 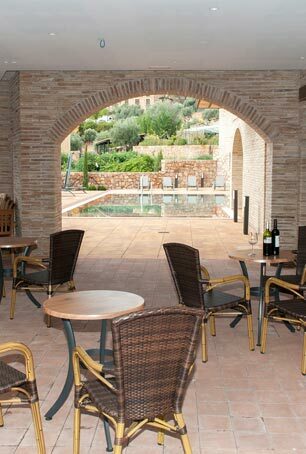 There is also a covered terrace area next to the swimming pool where you can order a drink whilst enjoying the fresh air. The hotel’s interior garden also offers inviting corners where you can enjoy the warm rays of sunshine in the winter and the protective shade in the summer. Hotel Villa de Alquézar is the perfect place to relax and relive the day, plan the next day or relax the muscles.